This is a sturdy, elegant HDF-shelf for collectors figures (with or without boxes). An acrylic window covers the complete front and protects all items from dust and damages. The window can be easily taken off. 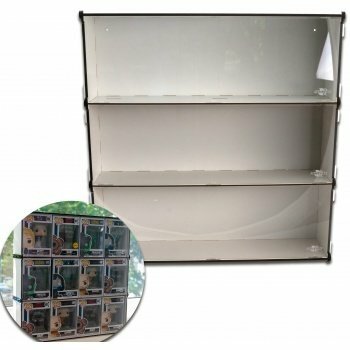 This display provides 3 shelves á 16.8x48 cm and can keep up to 12 figures in cardboard boxes.